I'm spreading the gospel of scrapple! Today my first blog as a contributor to WPSU's Local Food Journey was published. 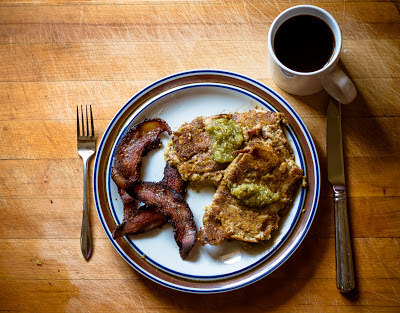 For my first article I focused on one of my favorite Pennsylvania Dutch foods: scrapple. Going forward, I should have two articles each month on WPSU. Special thanks to Leslie for telling me about the call for contributors! Scrapple, jowl bacon, and coffee - a breakfast of champions. Congratulations on the WPSU Blog. I knew you when!!! !